Press on both feet the areas for the waist, sciatic nerves, tailbone and coccyx. You can also apply pressure to the chest cavity point, to relieve tension. There are also points on the external part of the feet that reflect the sciatic nerves, shoulders and hip. 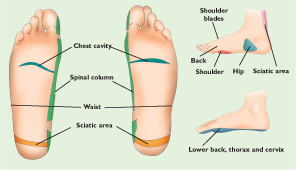 On the internal part of the feet points correspond to the lower back, thorax and cervical areas. And on the top of the feet, points that correspond to the back and shoulder blades. + According to the teaching of reflexology there are points on your feet directly connected to the organs in the body. For example, on the inner edges of both feet there are points that correspond to the spinal column; if you suffer from lower or upper back pain, these pressure points may help to relieve pain in these areas. The reflex points only work when there are imbalances in the organs that correspond to the point; the treatment consists of pressing with your thumbs on the point that corresponds to the ailment. Massaging each point should last about a minute and it's necessary to repeat the massages in a cyclic rhythm, two or three times per session. As with all “physiotherapy of contact” it's necessary to use the treatment regularly: two or three times per week for three to six weeks to get positive results. Reflexology shouldn't be used on people who have a fever, suffer from foot ailments or need surgery. It isn't recommended for during pregnancy. 1. Start by massaging the entire surface of the foot. Massage the base of the foot with your thumbs, using circular, clock-wise movements to activate and counter clock-wise movements to soften the foot. 2. Apply finger pressure on the point that corresponds to the spine. Your thumb on the upper part of the foot works the cervical area and the thumb on the lower part, the lower back. 3. With your thumb, apply pressure on the side of the foot, the part that reflects the upper back. With your other thumb, press on the outer part of the ankle to work on the coccyx. 4. Apply pressure on the point that reflects the chest cavity, to balance and harmonize the vital energy in the body. This point is especially important for those who suffer from nervousness or stress.